Over the next few days, we at IDA will be introducing--and in some cases, re-introducing--our community to the filmmakers whose work has been nominated for an Academy Award for either Best Documentary Feature or Best Documentary Short Subject. As we did in conjunction with the DocuWeekTM Theatrical Documentary Showcase that we presented last summer, we have asked the filmmakers to share the stories behind their films-the inspirations, the challenges and obstacles, the goals and objectives, the reactions to their films so far, and the impact of an Academy Award nomination. So, to continue this series of conversations, here is James Marsh, director of Man on Wire, which is nominated in the Documentary Feature category. 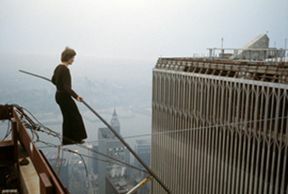 Synopsis: On August 7, 1974, a young Frenchman named Philippe Petit stepped out on a wire illegally rigged between the Twin Towers of New York's World Trade Center, then the world's tallest buildings. After nearly an hour dancing on the wire, he was arrested, taken in for psychological evaluation, and brought to jail before he was finally released. Man on Wire brings Petit's extraordinary adventure to life through the testimony of Philippe himself, and some of the co-conspirators who helped him create the unique and magnificent spectacle that became known as "the artistic crime of the century." point of shooting. Editing is a great way into filmmaking, and I still do a first rough cut of my films myself. IDA: What inspired you to make Man on Wire? characters in the film) when I first spent time there as a penniless student in the late '80s. producers, and we ended up making the film with executives who loved the idea as much as we did. The main creative challenge was trying to figure out how to bring to life events that took place over 30 years ago and examining both the propriety and then practicalities of shooting reconstructions. Another big challenge was collaborating with Philippe Petit, whose story I was telling. At a certain points, we had quite passionate discussions about the direction of the film, and these became even more intense as we were editing. There was also an ongoing and quite complex human drama to navigate amongst the other contributors. There was conflict and disagreement between them during the actual execution of the walk, and a lot of those issues were still in play for us. I tried to do right by all the people who are in the film, and I think most of them are OK with the finished article. we did any filming. Unusually for a documentary, Man on Wire has a flashback structure with three overlapping timelines--the day of the actual break-in to the towers, the backstory to the break-in with the recruitment of accomplices and planning of the adventure, and the building of the towers themselves, which ran parallel to the planning. I had worked these out beforehand and surprisingly, the structure held together well as the filming unfolded. The big revelation during the production process was the archive film Philippe himself had kept unseen and unprocessed for 30-odd years. Philippe had documented a lot of the preparations to his walk on 16mm film. It was beautiful and highly revealing footage and I literally jumped for joy when I saw it. During the edit, I was left alone to make the film I wanted. There was no interference at all, just support and encouragement. IDA: As you've screened Man on Wire--whether on the festival circuit, or in screening rooms, or in living rooms--how have audiences reacted to the film? What has been most surprising or unexpected about their reactions? the audience response was so emotional and generous to the film. That was amazing, given the location, and it made me very happy. The only other screening that was that intense was in Sarejevo. JM: In the documentary category, there's a shortlist, ahead of the nominations, so it definitely raises the stakes on the day. I was in Copenhagen, and I got a call from the BBC in London. I had miscalculated the time difference and didn't expect to hear anything until an hour later. I'm not sure how this will affect my career; I hope it means that I can work more. I have often struggled to make a living, and at certain points of my career, I felt defeated and worthless as a filmmaker. I'm pretty sure I will feel that again, and I would worry if I didn't! moralized. Nigel encouraged me to make films according to my own taste, and he gave me the best advice I ever had: You can do anything you like with a film, as long as you are not boring. Nigel died tragically young and I still miss him. Man on Wire will be screening Saturday, February 21 at 9:30 a.m. at the Writers Guild of America Theater in Beverly Hills, as part of DocuDay LA, and on Sunday, February 22 at 4:15 p.m.
at the Paley Center for Media in New York City as part of DocuDay NY.